Unrivalled in its coverage and unique in its hands-on approach, this guide to the design and construction of scientific apparatus is essential reading for all scientists and students in the physical, chemical, and biological sciences and engineering. Covering the physical principles governing the operation of the mechanical, optical and electronic parts of an instrument, the fourth edition contains new sections on detectors, low-temperature measurements, high-pressure apparatus, and updated engineering specifications. There are over 400 figures and tables to permit specification of the components of apparatus, many new to this edition. Data on the properties of materials and components used by manufacturers are included. Mechanical, optical, and electronic construction techniques carried out in the laboratory, as well as those let out to specialized shops, are also described. Step-by-step instruction, supported by many detailed figures, is given for laboratory skills such as soldering electrical components, glassblowing, brazing, and polishing. SANDRA C. GREER is Professor Emerita of Chemistry and Biochemistry and Professor of Chemical and Biomolecular Engineering at the University of Maryland and is now Provost and Dean of the Faculty at Mills College in Oakland, California. She is a Fellow of the American Physical Society and the American Association for the Advancement of Science, and recipient of the American Chemical Society Francis P. Garvan–John M. Olin Medal. Building Scientific Apparatus covers a wide range of topics critical to the construction, use, and understanding of scientific equipment. It serves as a reference to a wealth of technical information, but is also written in a familiar style that makes it accessible as an introductory text. This new edition includes updates throughout, and will continue to serve as a bookshelf standard in laboratories around the world. I never like to be too far from this book! For many years, Building Scientific Apparatus has been the first book I reach for to remind myself of an experimental technique, or to start learning a new one. And it has been one of the first references I’ve recommended to new students. With valuable additions (e.g. tolerances table for machining, formula for aspheric lenses, expanded information on detector signal-to-noise ratios, solid-state detectors…) and updated lists of suppliers, the newest addition will be a welcome replacement for our lab’s well-thumbed previous editions of BSA. I like this book a lot. It is comprehensive in its coverage of a wide range of topics that an experimentalist in the physical sciences may encounter. It usefully extends the scope of previous editions and highlights new technical developments and ways to apply them. 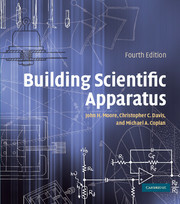 The authors share a rich pool of knowledge and practical expertise and they have produced a unique and authoritative guide to the building of scientific apparatus. The book provides lucid descriptions of underlying physical principles. It is also full of hands-on advice to enable the reader to put these principles into practice. The style of the book is very user-friendly and the text is skillfully illustrated and informed by numerous figures. The book is a mine of useful information ranging from tables of the properties of materials to lists of manufacturers and suppliers. This book would be an invaluable resource in any laboratory in the physical sciences and beyond. The construction of novel equipment is often a prerequisite for cutting-edge scientific research. Jack Moore and his coauthors have made this task easier and more efficient by concentrating several careers’ worth of equipment-building experience into a single volume – a thoroughly revised and updated edition of a 25-year-old classic. Covering areas ranging from glassblowing to electron optics and from temperature controllers to lasers, the invaluable information in this book is destined to save years of collective frustration for students and scientists. It is a “must-have” on the shelf of every research lab. This book is a unique resource for the beginning experimenter, and remains valuable throughout a scientist’s career. Professional engineers I know also own and enjoy using the book.